Bulk Condoms Assortment available in 128/ Box, 512/ Case & 1024/ Case. A variety of our most popular condoms in a single box! Includes condoms by ID Condoms, Trustex, Fantasy, Lifestyles, Lucky Boy, Crown, Beyond Seven, Caution Wear, and more. 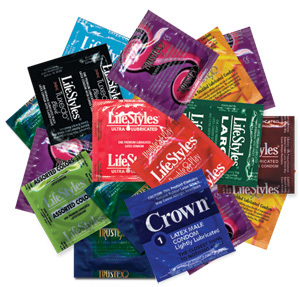 Each case includes a wide range of textures, colors, flavors, extra strength and sensitive condoms. Does not contain Nonoxynol-9. Not all cases contain all brands due to variations in product availability. Available in 3 options: 128 per box, 512 per box, and 1,024 per case.